For the song, see Irish Heartbeat (song). "I'll Tell Me Ma" b/w "Tá Mo Chleamhnas Déanta"
Irish Heartbeat is the eighteenth studio album by Northern Irish singer-songwriter Van Morrison and is a collaboration with the traditional Irish musical group the Chieftains, released in 1988. It was recorded at Windmill Lane Studios in Dublin, Ireland, and reached number 18 in the UK album charts. The album was recorded on dates from September to December 1987 and in January 1988. 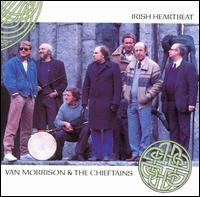 The Chieftains and Van Morrison had met years before at the Edinburgh rock festival. They joined up in Belfast during Morrison's No Guru tour and afterwards, Morrison and Paddy Moloney discussed recording an album together during a walk. They each had a list of songs and reached a consensus to cover two of Morrison's previously released tracks (the title track was one) and the rest from traditional Irish songs. In October 1987 they performed together at Balmoral Studio in Belfast. The concert was broadcast on St. Patrick's Day in 1988. The album consists of eight traditional Irish songs, plus re-workings of the Morrison songs "Celtic Ray" (which first appeared on 1982's Beautiful Vision) and the title track "Irish Heartbeat" (which first appeared on 1983's Inarticulate Speech of the Heart). "Carrickfergus" is described as "a melancholic air worthy of Otis Redding" by critic Denis Campbell. "on Raglan Road" was adapted from a poem by Patrick Kavanagh and is the story of "a man ensnared by a beautiful revenant whom he had mistaken for 'a creature made of clay'." In 1994, Billy Connolly recorded a live cover of the song "Irish Heartbeat" during his World Tour of Scotland. The performance was used as the closing theme to the BBC series. Irish Heartbeat received positive reviews from most critics, one of whom called it "some of the most haunting, rousing, downright friendly music of the year". Rolling Stone magazine's David Browne said it has "splendor and intense beauty", while John Wilde from Melody Maker hailed it as "a bloody considerable marvel", having "awakened [Morrison's] roisterous spirit". In The Village Voice, Robert Christgau was more critical and believed that Morrison, suffering a creative block, is "misguided" in his attempt to reconnect with his traditional Irish music roots. In the annual Pazz & Jop critics poll, Irish Heartbeat was voted the 29th best album of 1988. The NME named it the second greatest album of the year. In The Rolling Stone Album Guide (2004), Rob Sheffield said it showed Morrison in a livelier, more enthusiastic state than on his previous records during the 1980s. All songs traditional, arranged by Van Morrison and Paddy Moloney, except as indicated. Kevin Conneff – bodhran, co-lead vocals on "Star of the County Down", "Tá Mo Chleamhnas Déanta" and "I'll Tell Me Ma"
Mary Black – backing vocals on "Marie's Wedding" and "Tá Mo Chleamhnas Déanta"
Maura O'Connell – backing vocals on "Marie's Wedding"
June Boyce – backing vocals on "Celtic Ray", "Irish Heartbeat" and "Marie's Wedding"
^ Glatt, The Chieftains, p. 217. ^ Hinton, Celtic Crossroads, p. 266-267. ^ Hinton. Celtic Crossroads. p.269. ^ Ruhlmann, William. Irish Heartbeat at AllMusic. Retrieved 2011-06-28. ^ Larkin, Colin (2006). Encyclopedia of Popular Music (4th ed.). Oxford University Press. pp. 11–12. ISBN 0195313739. ^ Heylin, Can You Feel the Silence?, pp. 418-19. This page was last edited on 4 November 2018, at 23:22 (UTC).